This year the Brown University Book Award will be The Human Instinct: How We Evolved to Have Reason, Consciousness, and Free Will by Kenneth R. Miller '70, Brown University Professor of Biology, Royce Family Professor for Teaching Excellence. The cost of the Brown University Book Award is $35.95, which includes shipping and handling. Language is the highest expression of our humanity; it defines what we are and what we aspire to be. Those who use words effectively will be the leaders in their next generation. In them we invest our hope; to them we accord our respect. With this award, we salute their potential. The Brown University Book Award is presented to a junior at a school's annual book awards presentation. It is awarded to a junior who exhibits excellent verbal and written communication skills. The award itself is a book written by a Brown University faculty member or alumnus. The program was started by the Brown Alumni Association in 1960, with 100 books being awarded at that time, and has grown through the generosity of our alumni. The goal of the Book Award program is twofold: it combines the satisfaction of rewarding individual scholarship with promotion of Brown University's name among high school and preparatory school students. Now, the Brown Bookstore handles the administration of the Brown University Bookstore. However, the awards themselves are usually sponsored by a Brown University alumnus, though sometimes the school itself, or one or its faculty or staff, sponsors the award. The book presented for the Brown University Book Award is determined yearly. A committee chooses a recently published book by a Brown University Professor or Alumnus that reflects the criteria of the award. The book award is presented to an outstanding junior who exhibits excellent verbal and written communication skills. Price includes shipping and handling to the sponsored school. The Brown University Book Award is distributed by the Brown Bookstore. We welcome expansion of the program through the sponsorship of the award by individual alumni, Brown Clubs, or by the secondary school itself. The cost of the award is determined yearly. Sponsors choose the school(s) they would like to sponsor. 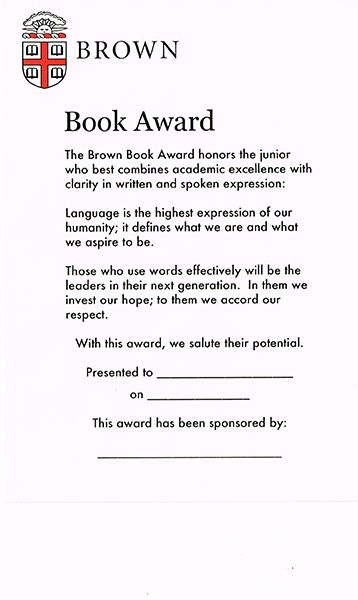 The school then must agree to present the Brown University Book Award at the their awards ceremony. The sponsor may choose the degree of participation, while most just sponsor the book award and let the school handle the selection and presentation of the book award, others attend or even present the book award at the awards ceremony. A select few even help with the selection of the recipient.